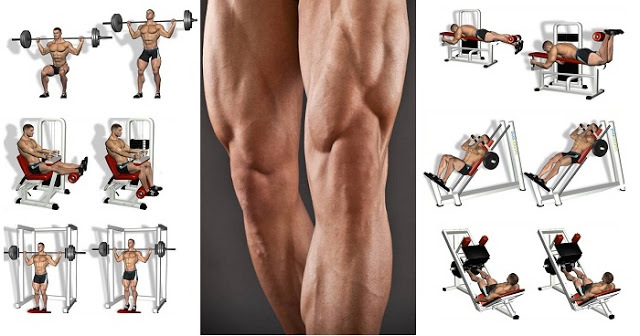 Most men want athletic looking legs and the best way to accomplish this is to perform the proper leg workouts. When you perform the proper leg workouts they will not only tone your leg muscles, but they will also increase your heart beat, and work your cardiovascular system. If you want to work on your quadriceps and strengthen your thighs then you should be performing leg extensions. To perform leg extensions workout you are going to have to sit on a leg extension machine and place your foot below the foot pad. Grab a hold of the handle and slowly raise the weights with your legs until your knees are straight. Hold this position briefly and then slowly lower your legs back to the position you started in. You should perform the up and down motion of this exercise slowly so you can get the most out of it. Some people complain that performing squats hurt their knees or their back. However, the only way squats can hurt your knees or your back is if you perform them incorrectly. Your body must maintain a good posture when performing a squat and if you lean too far forward while performing a squat you can damage your lower back. To properly perform a squat you need to stand up straight with your feet shoulder width apart. When using a barbell you should hold it firmly with your hands and position it steadily on your upper back with your palms facing forward. Now slowly bend your knees until your thighs are parallel to the ground. You must keep your back straight and both feet flat on the ground. Once you have squatted all the way down you must slowly raise your body back up to the position you started in. Performing squats is one of the most effective leg workouts that will build athletic legs and also work the rest of your body as well. Leg curls are also known as hamstring curls and this leg workout will tone the back of your thigh. To perform the leg curl you should be face down on a leg curl machine. First you must place your feet below the foot pad with your knees slightly off the pad and your ankles touching the foot pad. Grasp the handles of the machine firmly and slowly lift your heels towards your backside. Hold that position for a second and then slowly lower your leg back to the position you started in.